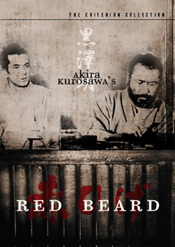 Red Beard is one of Akira Kurosawa's very best films. It's a long, slow tale set in a public clinic in Japan, perhaps a hundred years ago. In essence it's a 'Dr. Kildare' story, a melodrama about a young intern learning that being a doctor is more than wealth and social position. But Kurosawa pares the story down to its essentials, and attaches us to the emotions of his characters without tugging at us for a sentimental response. He gets it anyway -- the film is a powerful experience. Medical student Noboru Yasumoto (Yuzo Kayama) thinks he's only visiting the impoverished public clinic where the dirty poor are served, but he finds out that he's been assigned there by the magistrate and has no choice but to stay. Out of spite he refuses to help the taciturn clinic director Kyojio Niide, known to everyone as Redbeard (Toshiro Mifune). Yasumoto at first refuses to even wear the clinic uniform but eventually becomes interested in the patients, particularly an old dying man and a madwoman kept in a special ward by herself. All of these people have stories and reasons for being sick, which as Redbeard explains, are often a result of their poverty. When Redbeard rescues an abused girl kept by the owner of a brothel, Otoyo (Terumi Niki) Noboru takes on the task of bringing her out of her shell of terror. The last thing one wants to do is detail the plot of a film like Red Beard. The right way to see it is to force oneself to watch the first 20 minutes. By then, anyone should be hooked. If you need the added impetus, there's an exciting and rather gory fight scene near the midpoint, where Mifune singlehandedly takes on ten thugs. It was obviously included to liven things up for fans of action . Red Beard's grace note is its utter honesty and simplicity. We're used to seeing this kind of material packed into manipulative melodramas that peddle sentiment as a commodity. The headstrong but spirited young doctor tangles with the gruff head surgeon who turns out to be a big softie too. We've seen it a million times in movies about many kinds of professionals, especially on television. What Red Beard gives us that's different is an education about people. Along with the thoughtless young doctor we discover that everyone, even the poor and unpleasant, carry personal stories that can't be appreciated at first glance. People themselves aren't evil, they do bad things for understandable cause. A callous woman's crimes turn out to be the result of a horrible personal dilemma. An habitual good samaritan confesses that the good face he shows to his neighbors is there to hide past weakness. Young intern Noboru thinks he's ready to become the Shogun's doctor, yet has never had the experience of watching a man as he slowly dies. Nor has his book-learning prepared him for the rigors of real surgery, close-up and messy. His head can be turned by a pretty face even after he's been warned. As an audience we experience these things with Noboru, and to a degree, learn along with him. Noboru eventually turns full circle in his thinking and finds the meaning of empathy and humility in Redbeard's dingy hospital. Redbeard is a thoughtful leader who quietly spreads understanding and virtue yet is not above pressuring the rich to fund his clinic. As played by an older Toshiro Mifune, he shows all the wisdom and restraint of the leader of the Seven Samurai. Redbeard isn't some gruff martinet who slowly softens, so that we can warm up to him according to a screenplay timetable - he's firm and consistent all the way through, even as he questions his own motives and methods. The simple key to Redbeard's kindness is his refusal to retaliate when the sick and the hurt lash back at him. Noboru is insolent, hoping to be thrown out of the clinic in a rage. Instead, his rudeness is met with silence and patience. The hurt child Otoyo savagely resists the doctor's attempts to help her. The key scene is when Redbeard attempts to feed her, time and again getting the spoon slapped from his hand, yet always responding with a gentle smile. Redbeard understands that it will take a lot of patience to break through Otoyo's defensive aggression. Otoyo's psychological recovery triggers a similar personal journey in Noboru, a self-enlightenment that is genuinely uplifting. The clinic becomes for a while a little Utopia, when Otoyo's befriending of a young thief (Yoshitaka Zushi) inspires even the gossiping, rough cooks to look differently upon their 'dirty' patients. By this point Kurosawa's direction of the actors, particularly the children, has become invisible. This is some of the famed director's best work - nothing about these young actors seems confected or directed for a calculated response. When we respond to these characters, the emotional depth seems limitless. Kurosawa's camera often uses long lenses to flatten the Tohoscope screen into field of characters in very formal patterns. This contrasts sharply with the wild dynamics of other scenes, making them all the more jarring - the surgery on the struggling, twisting woman, the fight. Even the frequent perspective shots down the hallways are atypical for Kurosawa. The general restraint makes a dramatic setpiece, like the tilting view down the well near the conclusion, all the more unforgettable. The delicate soundtrack, in original 4-track stereo, contributes to the reality of the everyday details in the clinic - grinding herbs, keeping endless notebooks. At one point Redbeard takes a portable inkbrush from his pocket and uses it to annotate a rich man's diet. It's something we've never seen before, just a part of everyday life, but it adds to the texture of the film. Criterion's DVD of Red Beard is presented with the same high standards as the rest of their later Kurosawa releases. The hi-def transfer is in 16:9 and has been digitally scrubbed. Just over three hours in duration, the show doesn't seem long. There's a midpoint break for an intermission with music. Donald Richie provides a succinct set of liner notes, letting us know that the colossal set built for Red Beard is barely glimpsed in the movie. Film scholar Stephen Prince provides the commentary, which analyzes Kurosawa's visual technique in great detail.